Back in July, we told you that the Telecom Regulatory Agency of India (TRAI) developed its own anti-spam app called DND. Being the telecom regulator in the country, TRAI also added a new regulation that required all smartphones in the country to have the app installed. Because the app uses an iPhone's phone and messaging logs, Apple refused to allow it to be included in the Indian App Store due to privacy concerns. The TRAI regulation was written for carriers since the agency has no power over phone manufacturers. So back in July, the agency told the wireless operators in India that if Apple didn't allow the DND app to be listed in the country's App Store within six months, it would ban the iPhone from the networks belonging to all Indian carriers. As we've noted before, India is the second largest smartphone market in the world. However, its low per capita income means that low priced and older smartphones are big sellers in the country. For example, it wasn't too long ago that the iPhone 5s was the top selling iOS powered handset in the market. It also explains why Apple manufactured the iPhone SE in India, and now churns out the iPhone 6s in the country. Considering the potential of the Indian smartphone market, Apple did not want to have the iPhone essentially banned in the country. So it blinked first according to Venture Beat, and has now listed the DND app in the Indian App Store. With the average smartphone user in the country receiving up to 10 spam calls and texts a day, the app allows users to join a "Do Not Disturb" list and report unwanted calls and messages. Indian consumers sporting an iPhone running iOS 12.1 or later can install the DND app for free by clicking on this link. LOL, Apple will bend over to any government that have 40+ millions population to expanding market share for satisfy their hungry shareholder and their own interesting. Talk is cheap, follow the money. It’s on the App Store, but can telecoms know if the iPhone owner chose to install the app or not? Lmao. Desperation in the name of money. When a privacy wannabe company bended by money, so satisfying to see. Or, maybe, to keep current Indian’s iPhones on the network. At elast apple has privacy concerns. Unlike your google who doesn’t care anymore and there’s no talk about it. Whoever wrote this article just wanted to creat a war in the comment section and drive traffic to the websit. Apple didn’t bend over or allowed an app they didn’t previously allow. 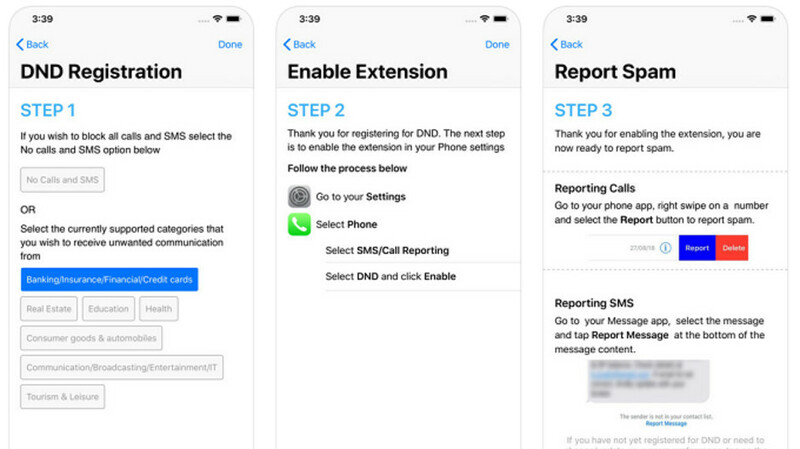 In iOS 12/12.1 Apple introduced new features for spam apps that would include all the functionality TRAI wants and similar apps yet the personal data of the users wouldn’t be shared or known to the app maker. Everything happens locally. Hence, the TRAI took advantage of the app modified it and re-released it. For everyone who wants to make sure I am not just bsing just go read any article about this subject else where! that's a pretty good point if true but the one flaw may be iOS 12 isn't supported on the vast majority of iPhones in circulation there. If the article was also accurate and the 5s truly was a best seller till recently then there's a good probability that theres a high percentage of iPhone 4, 4s, and iPhone 5 out there to. On tomorrows news: "China threatens to ban Apple and now they allow full access to any and all iPhones, iPads and MacBooks in the country, even if they belong to tourists or foreign authorities!" How does the Indian spam block differ from USA available apps like Mr. Number or even T-Mobile's Name ID app? I mean bravo to India for trying to be proactive in a way that's best for them, but wouldn't disabling millions of iPhones belonging to consumers who did nothing wrong / preventing emergency services access be a bigger problem than what they are trying to resolve? Here's the thing. The Indian government approved a law and it went into effect. I'm sure that manufactures were notified months in advance. Apple did not want to obey the law and were going to suffer the penalty for not obeying that law. That would mean that they did due process but a bad policy is a bad policy wether or not the paperwork was filed correctly.